Best Professional PCB Design Software For any production level of electronic device printed circuit board is the backbone for the electronic device. Traditionally in early days, Printed circuit boards were designed manually by creating a photomask on a clear mylar sheet which will be about two or four times the actual size of the PCB. Traces were made using self-adhesive tape and pre-printed non-reproducing grids on the mylar assisted in a layout. Modern PCBs are designed with dedicated PCB Design software. There are numerous software packages available for designing printed circuit boards and sometimes it becomes daunting to decide and choose the Best Professional PCB Design Software. However, it is the type & complexity of the design which ultimately should be considered before finalizing any of the software. Some of the common & most popular software which are used in PCB designing are Altium, Eagle, and orcad. Type of application and purpose: Is it for a hobby? Consumer or Industrial market? Or for Mission-critical project or product? Portability: Free tools and program sometimes do not allow to export or convert the design. Understand the limitations. Capability: Understand diversified layout design limitations – is it a number of boards or components? Is your design for one-time use or it’s scalable? Community Support: More popular the package, more changes of getting ready-made libraries for the part number which will be required in the project. Ease-of-use: Don’t worry too much about it. All tools seem complicated initially and practice is the key to know about the tools. The list below gives an idea about some of the Best Professional PCB Design Software, but this list cannot be considered exhaustive and should be used only to understand PCB Design software comparative key features. PCB Web supports both schematics and PCB layouts for electronics engineers who are looking to simplify the hardware design. PCB WEB is an ideal tool for designing and manufacturing electronics hardware. To design multi-sheet schematics with PCB webs is fast and easy to use writing tool. Tiny CAD software helps in drawing electrical circuit diagrams or schematic drawings which will be printed on printed circuit board (PCB). This software allows to copied and pasted into a word document. This Tinycad comes with many symbol libraries. BSch3V is a popular design software tool for electronics engineers who need a free solution.BSch3V is for windows vista/7/8/10 and basic functions to simplify operations. Circuit maker also works together to invent circuits and electronics products. Electronic engineers looking to create products to better the future often use circuit maker to turn their idea into products. Rely on the community to find reference designs and to promote and rate others projects. Portel introduced the circuit board design software in the circuit industry it is a good one for two layers board however it becomes harder to use when it comes to 4 layers. 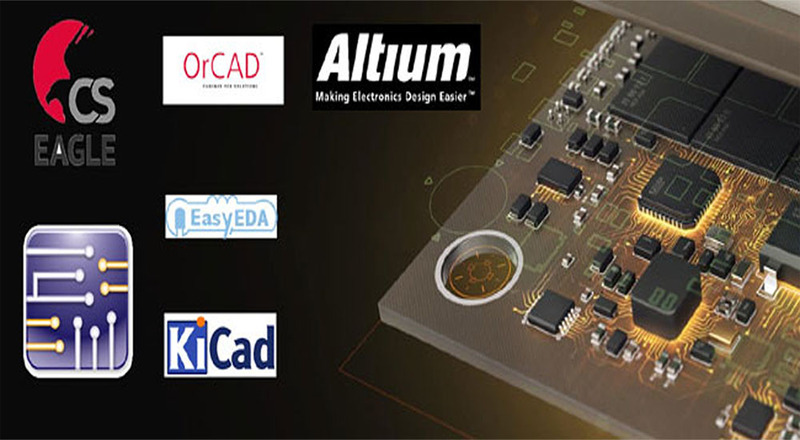 Altium Designer is efficient easy to use and meet the requirements of the professional electronics engineers. PADS is the king of the cad in the low side it is the best EDA among the similar EDA for its easy use easy to learn pads are widely used EDA in the market and it is also very suitable for small companies and advanced features like physical design reuse. EDA software is developed by ORCAD the best complete PCB design software for circuit simulation PCB layout and PCB manufacturing design. ORCAD is great fame in the industry since it is friendly user face. Grows with evolving design challenges and provides scalability for future challenges. Fully integrated simulation and analysis technologies ensure first pass-success without any need for translations. The workflow of the PCB designs goes quickly and easily. Placement features allow for placing components manually by simple drag and drop or automatically according to custom settings. Argus Technologies is in business since May 2008. The rich experience gained over those years in various fields of electronics design, software, prototyping & manufacturing, Advance PCB testing, PCB Manufacturing, PCB testing, PCB assembly printed circuit Boards, PCB Fabrication is a huge advantage and using best professional PCB design software.